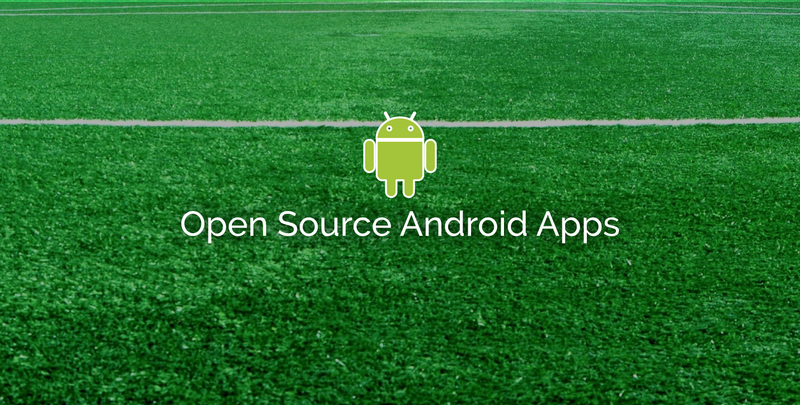 Best Open Source Android Apps are great for sharpening your programming skills. They are a valuable resource that can help you become a great developer. You can examine and explore open source apps code and build better apps on top of these projects and launch your own applications. You can watch courses or read books, blogs, forums, and documentation to learn to programme considerably, but there is no alternative to reading a well documented, fully-functional and well-tested app along with its external resources to master the art of programming. Here is the list of best open source Android apps that are mostly written in Java from various categories to help you become a professional Android Developer. These apps are also available on the Google Play Store and you can use them before diving right into the code. We have attached the difficulty level, GitHub and Play Store link with each app in the list. Amaze File Manager is a Material design file manager for Android. A file manager is an extremely common app that is natively available on almost all Android devices. You can learn how to build a file manager by reading and examining the Amaze File Manager code. It will teach you how to how to perform file handling across all Android platforms and how to perform basic operations such as create, cut, copy, delete, rename, compress, extract, and encrypt files and folders efficiently. Orbot is a free Proxy app that allows other internet apps to use the internet safely without being monitored. It is very similar to Tor Browser and in fact, it uses Tor to encrypt internet traffic. It then routes this through a series of computers. It has a built-in VPN and any app can use it. It is also the official version of Tor for Android devices. It is designed to protect your security and allow you to be anonymous. They use state of the art of protocols for security. You can use Orfox web browser which is built upon the source code of Tor with Orbot proxy to hide your privacy. Minimal ToDo is a material app with minimal features to make it useful. It is a very simple project that will teach you some of the basic stuff about Android Development. I recommend going through this project if you are a beginner. You will learn about fragments and how to design a decent app. Omni notes is an open source note-taking application for Android. Omni notes is a big project that has all sorts of note-taking app features. You can add, modify, archive, trash and delete notes. You can share them and search them using full-text search available. Tags and Categories, as well as sketch-note mode, is also available. If you are looking for Google Now integration, you can check out this project because it comes up with its implementation. All in all, it is a big project with a lot of features. The Android port of the 2048 game for offline playing. It’s just a web view that loads the HTML files that are stored locally. The code is not too great but you can learn how to use assets and create a very simple game. VLC Media player Official App for Android. VLC is a popular and open source media player used by a large number of people and organizations. It is a very big project with a large number of components. You need to be an advanced professional programmer to understand and examine this project. LeafPic is an ad-free, open-source and material-designed android gallery alternative. LeafPic is one of the best photo and video gallery application from hundreds of others on the Play Store. It is fluid, material design, and open source available under GPL license v3. You can examine LeafPic’s code to understand how to create a gallery application. This app also offers dynamic theming, image crop and many other features that will help you become a better Android developer. The Official Google I/O 2018 conference app to navigate the conference. Google I/O is a simple beautifully designed app. Its source code was released after the I/O. With this app, you can explore the conference schedule, save events, get reminders, and much more. This app is written in Kotlin. You can dive into the code and learn how to design a great project. This app is well designed and since this app is developed by Google, you can expect the code quality and design to be great. Easy-sound-recorder is a simple sound recording app that uses Material Design Guidelines. It is a simple sound recorder app that can help you learn how to work with audio recording in Android. It is a beginner level project that you can use to understand how to create a basic app that implements Material Design along with TabLayout and using CRUD with the filesystem. DuckDuckGo Privacy Browser that makes privacy simplified. DuckDuckGo is a search engine that focuses on protecting user privacy and avoiding personalized search results. The Android app source code is quite complex and large. This app uses Kotlin and C++. You can dive into this app’s code and learn how to create a fully working and well tested commercial application. Resume plays an effective role in getting a great job. Writing a resume is not easy for everyone. You should never use a handwritten resume. A resume is your first impression when applying for a job. Resume templates are great because they allow you to make professional and beautiful resume faster. There are literally thousands of resume submitted for a job and you must stand out from the crowd to get any attention. You can use Resume templates and create a professional resume without any designing or creative experience. Most resumes have four basic sections (Contact information, Education, Objective, and Experience). Hiring managers get the most significant information with these details. While graphical resumes are quite good looking but they are terrible at getting the job done. Instead of showing your hard earned accomplishments, you will be showing pretty pictures and useless graphics. Experience part of the resume is common for all resumes and it is also quite important. Here you write your professional work experience. If you got a scholarship then don’t forget to mention it. The world’s BESTSELLING career course! Job Search, Resume / CV Writing, LinkedIn, Networking, Interview Skills, + more! 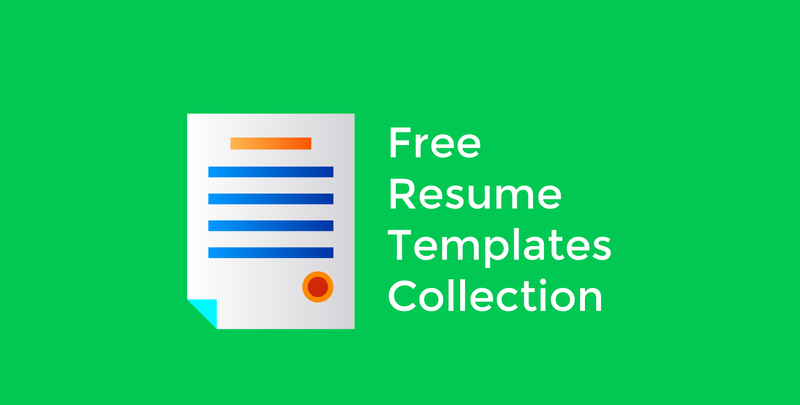 With the above points in mind, we have made an ultimate collection of free professional and beautiful resume templates. As said earlier graphical resumes, in general, are terrible but we have listed them down because you may find the need to use one. Resumes are available in different formats: HTML, PSD, MS Word, PDF, and Adobe Illustrator. A very professional resume by Gayle Lackman Macdowell. This resume is required by Wharton’s MBA program and this one is also designed by Gayle Lackman Macdowell. Both of these resumes are available for free and are designed by her. These resumes can be used for general purpose. They are great because hiring managers can easily see all of your accomplishments. You can download them from the link below in the sample resources section in the link. By an Award Winning MBA Prof. Who Successfully Changed Careers from Goldman to Consulting to VC to Hedge Funds to Tech. Developers often minify their web code for better performance because minification decreases the file size. Sometimes you want to edit your minified code again. It is extremely difficult to edit your minified code. To make your minified code better formatted and easily editable, we use code beautifier or Unminifier. There are a lot of editors and IDE’s as well as online tools available that can readily format your code. In this post, we have listed the best tools available to unminify or beautify your code. In some of the tools, you can also add formatting options like indentation, spacing and line breaks. These tools can unminify unlimited lines of CSS code. You can also comment your best beautifier in the comment section at the end of the post. Below is the list of online tools that you can use to beautify or unminify your CSS code. Unminifier tool will unminify, deobfuscate, beautify and format ugly HTML, XML, CSS and JS code to make it readable again. It is a very great tool to minify HTML, XML, CSS, and JS code. Simply paste your code and click the unminify button to unminify your code. Clean CSS tool allows you to format your CSS code. You can also load a CSS file or add a URL to the CSS code and this tool will beautify it. This tool allows you to format a CSS files with the chosen indentation level for optimal readability. It supports 4 indentation levels: 2 spaces, 3 spaces, 4 spaces, and tabs. You can also upload a CSS file to beautify and better format. Code Beautifier is a CSS formatter and optimizer based on csstidy 1.3. It comes up with a lot of customizations that you can use to format your CSS code the way you want. A simple online tool to unminify CSS. It is a simple minify tool that also allows you to specify the width of the tab. CSS Unpacker allows you to unpack your CSS files to make them more readable. It is a simple tool to optimize and clean your CSS code and remove any unnecessary characters from the file to reduce its size. 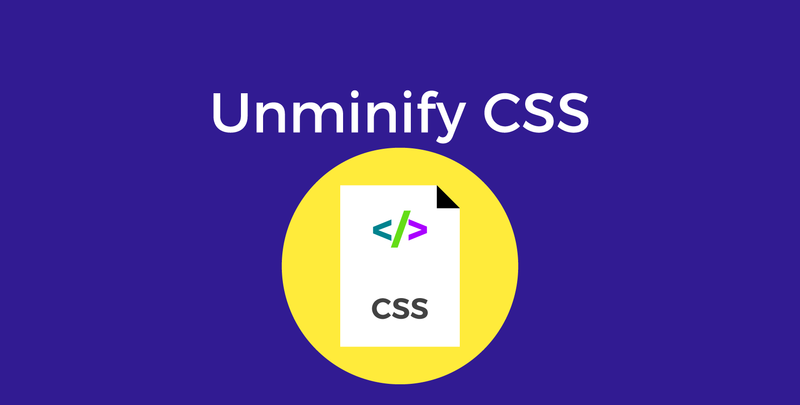 You can minify as well as unminify your CSS code using this great tool. A simple CSS Minifier online – unminify – beautify/format tool. Just paste your CSS code into the box and push the button. That’s all. A simple CSS Unminifier and beautifier to make CSS easy to read and debug. Below is the list of code editors, IDE’s or extensions that allows you to unminify or beautify your CSS code. You can beautify or unminify your code in Sublime Text using the HTML-CSS-JS Prettify extension. Simply install it using Sublime Package Manager and then go into the Tools -> Command Palette and type htmlprettify. Now open the HTML, CSS, or JS file and then pop out the console in Sublime Text from View -> Show Console and type view.run_command("htmlprettify"). In WebStorm/PhpStorm IDE’s, it is very easy to beautify your code. Simple open your CSS file and then choose Code | Reformat Code, or press Ctrl + Alt + L to beautify your code. It works with HTML, CSS, JS, PHP and many other languages. Material design was developed by Google as the design language in 2014. Material design takes the mobile-first approach. The idea of material design is to create a unified experience for all the company’s web and mobile apps across platforms and device sizes. Material design uses grid-based layouts, proper animations, responsiveness, transition, and shadows. It is designed from the thinking of how a paper would look like as a user interface. Material design has been adopted in many Google products including Android, Gmail, and Youtube. It is also used by many major companies on their websites and mobile apps such as Whatsapp. It is increasingly becoming popular nowadays. There are many Material Design based front end frameworks and libraries offering implementation with usable components and styles. In this post, we have listed best material design frameworks for developers. Materialize is a modern responsive front-end framework based on Material Design. It is really easy to get started because of its detailed documentation. It also comes with a SASS version, which allows users to choose which components to include. Materialize is one of the most popular Material design frameworks. It is ideal for getting started with Material design. Muse-UI is one of the lightest CSS frameworks that follows Material Design Guidelines. The file size of CSS and JS files gzipped and minified amount up to 12KB. Muse UI is based on the Vue 2.0 elegant Material Design UI component library. The framework supports React, customizations via SASS and has more than 40 UI components. Material UI contains React components that implement Google Material Design Guidelines. If you are using React Framework, Material UI is the framework to go to. It contains dark and light themes for users to choose. It has become one of the most popular frameworks for implementing Material Design Guidelines. Material Design for Bootstrap is a great option Bootstrap users. It is based on the Bootstrap framework and you can use it to create components for Bootstrap 3 and Bootstrap 4. You can easily get started with the great documentation. Material design for Bootstrap has a great active community. Polymer is a library that provides a set of features for creating fast, reusable web components which you can import and use in your projects. It is developed by Google and community on GitHub. Polymer paper elements collection implements Google’s Material Design Guidelines. You can also use other polymer components to achieve material design layouts. It is used by Youtube, Google Earth, Netflix and many other big companies. Angular Material is a Material Design Framework built by Angular Team at Google. It is built particularly for implementing Material Design Guidelines in AngularJS. It comes with a huge collection of reusable and well-tested components, documentation with many working examples and their code, and an active community. Angular Material library exists separately for the AngularJS version 1 and AngularJS version 2+. Here are the details for the Angular Material for version 2+. Vuetify is a semantic component framework for Vue 2. It provides reusable components that make building applications easy. It is created according to Google’s Material Design Guidelines and has a great documentation along with code examples that you can use in your projects. Vuetify has a great active community which is definitely a huge plus. JFoenix is a Java library that implements Google Material design guidelines using Java Components. It contains classic Material components that you can implement using JavaFX. Propeller is a front-end responsive framework based on Google’s Material Design Standards and Bootstrap. It has a detailed documentation of its library components as well as code examples that you can use in your projects. Framework7 is an HTML framework to develop hybrid mobile apps for iOS and Android. It allows you to build web apps with native iOS and Android native look. It is also easy to prototype app as soon as possible. Framework 7 has a Material theme that you can use to build apps with the native Android look. Zurb Foundation is an amazing tool for building responsive web applications. Material Foundation allows you to create your web applications using the foundation framework implementing Material Design By Google. It works pretty well but it lacks some of the material components. Also, the development is no longer happening which is bad news. Ionic Material is an extension for Ionic hybrid mobile apps framework which means you do not have to make changes to your Ionic hybrid apps to give them Google Material Design look. It adds new classes, methods, and helpers to create the Material look without interfering with code behavior or styles. Bootswatch team makes a lot of Bootstrap themes. One of their themes implements Material Design Guidelines called Materia. It contains some of the classic material components but it is great if you are working with Bootstrap. You don’t have to make changes to your project other than replacing the Bootstrap CSS files with the theme files to get Material Design look. Material is based on fully responsive front-end framework Bootstrap 4. It implements Material components to Bootstrap but also adds many traditional Material Design Elements such as cards. It comes with a great documentation guide that will help you start from scratch easily. Essence is a CSS framework that implements Material Design Guidelines by Google. It is based on Facebook React.js library. You can build great looking web and mobile apps super-fast. Essence does not have a great active community but you can still use it in your projects. Lumx allows you to implement Material Design Guidelines in a pixel-perfect way. It is based on AngularJS. Lumx uses jQuery and Sass toolset Bourbon for styles that make it easy for customization. It also uses Velocity for creating animations. The documentation of the framework contains examples with code that you can use in your projects. It helps you design beautiful applications faster and easier. Phonon is a framework for building Hybrid mobile apps. It supports Apache Cordova and PhoneGap. Phonon is only 62.1kb which makes it a very light framework. It closely follows Google’s Material Design Guidelines. Material Design Icons is the official Icon set from Google. It’s not exactly a Material Design Framework, but you can use it in your Material Design projects. The icons are designed under Material Design Guidelines. You can choose from a huge list of icons and use them in your projects. You can easily implement them in your projects using a font collection or symbols and sprites. In this part 2 of the series: Master Regular Expressions, we will discuss literal characters, global mode, metacharacters, and escaping character. Let’s start learning the syntax of regular expressions with the simplest match of all, a literal character. In other words, letter b matches the letter b and letter C matches the letter C. It simply matches what we typed in. We are going to work with strings. Strings are just the finite sequence of characters i.e. letters, numbers, symbols and punctuation marks. If we match the regular expression /web/ against the text web, it matches the full text. /web/ also matches with the first three words of the website. It does not match the entire string website but it matches the first three letters of the website. It’s like searching in the word processor. Its the simplest match available. It just says look for the literal word “web” inside the string. Searches in Regular Expressions are Case-sensitive by default that may not be the way your word processor works. For Example, if we have regex /web/ and we are matching it against the string Web, it will not match because regex is trying to match with the lowercase w. Instead, if we try to match it with Web, it will match. If you want to make these searches case insensitive you could use the i flag. You can try them at regex101.com. Whitespace does matters in regular expressions. For example, regex /web/ does not match the string w eb. You could add the global flag in a regex editor by clicking the flag icon and selecting global. You could use global mode in a programming language by adding g after the regex or calling appropriate function or method. By default global mode is turned off when using regex in programming languages. In standard mode or non-global mode or non-global matching, the leftmost or earliest match is always preferred. As soon as it finds its first match, it returns. For example, if we have the string aalaallaa and we are going to match it against the regex /aa/. With global mode turned off, it will only match the first set of aa in the string. If global mode is turned on, it will match all sets of aa throughout the string. Therefore, in global mode /aa/ would match all three sets of aa in the string aalaallaa. It is because regex starts matching from left to right. Let’s start with a definition. A metacharacter is a character that has a special meaning instead of a literal meaning. These are the characters with special meaning. They transform literal characters into powerful expressions. There are only a few metacharacters to learan. We will take a look at most of them in the upcoming parts. They are complex because they have more than one meaning depending on the context. These metacharacters have variations between the different regex engines. Now we have got the idea about metacharacters. Let’s learn the first metacharacter, wildcard metacharacter. Wildcard metacharacter is the period sign. It matches every character except the newline character. If we add s or single line flag, the regex will also match the newline character. Wildcard metacharacter doesn’t match newline character because original UNIX regex tools were line-based. For example, let’s take the regular expression /c.t/. This regex matches “cat”, “cut” but not “cast”. It matches only one single character. It is the broadest match possible and it is the most commonly used metacharacter. It also causes a lot of mistakes. When matching a decimal number like 1.12, we write a regex like /1.12/. It will not only match 1.12 but also 1312 and even 1a12. When working with regular expressions, we need to be very careful in selecting and only selecting you want. If a metacharacter has a special meaning what if we wanted its literal meaning. As we saw in the previous lesson in /1.12/ we do not want the wildcard metacharacter. We want a literal period, a decimal. To do that, we use another metacharacter backslash character \. It escapes the next character and gives it a different meaning. In case of a period, it can be written as \.. In the example discussed previously, the regex will be written like /1\.12/. It will only match 1.12. It is true for all metacharacters. If the regex wants to match backslash, it can be escaped with a backslash like /\\/. This regex would match the string \. Literal characters must not be escaped because a lot of times it gives them a different meaning. Backslash with a w has a different meaning than a literal w. Quotation marks are not metacharacters. Therefore, they do not need to be escaped. Forward slashes need to be escaped because regex starts and ends with a forward slash. If forward slash is not escaped, it would act like the end of regular expressions. You can buy Master Regular Expressions from Scratch course for just $10. It will teach you Regular Expressions practically. 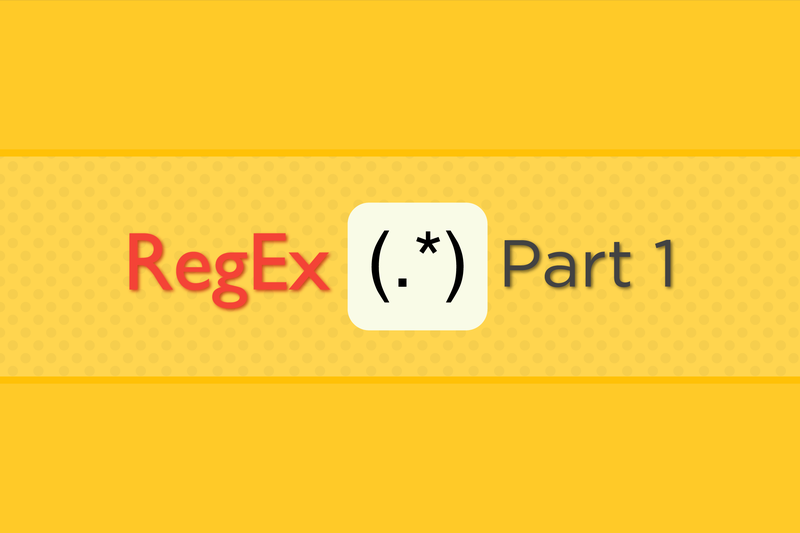 Read Part 1 of the series Master Regular Expressions Part 1: introduction, history, engines, notation, and modes. Part 3 will be available soon. Carbon is a free and open source library to create and share beautiful images of your source code. You can easily use carbon by visiting https://carbon.now.sh. Either simply start writing your code in the box, or drop a file into the text area available on the website. 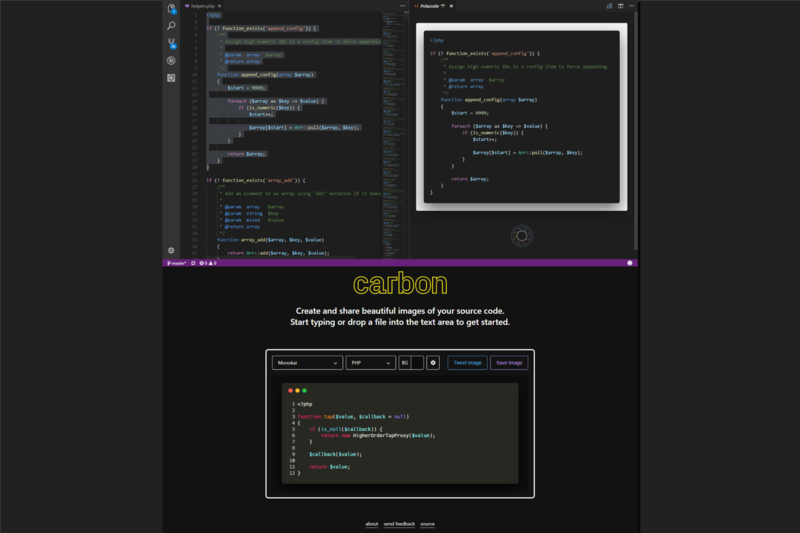 Carbon also plugins for various editors and IDE’s created by the community. You can find all of them here. Simply select code or open the file and follow the appropriate step available in the documentation. If you are working with PhpStorm or any other JetBrains IDE, simply select the code and select Open in carbon.now.sh from the context menu that you open by right-clicking the selected text. Polacode is an extension for visual studio code that allows you to quickly create awesome code screenshots. It keeps all of your styling and theme in the same place. You might be thinking why not just take a screenshot. You can easily install Polacode from visual studio code by opening extensions window and searching for Polacode. Then click install and you have that extension. Now open your desired file. Select the code you want in the screenshot and copy it. Now go to View > Command Palette and type >polacode in the box and select Polacode option. It will create a separate horizontal window. Click on the window and press Ctrl + V on windows or Cmd + V on Mac to paste the code. Below the code, you pasted in the other window, you will see a camera like icon. Click on this icon and save the picture. Well, now go ahead and create beautiful code screenshots and tweet them. In this tutorial series, we will master regular expressions from scratch. Let’s start with an introduction. Regular Expressions are a sequence of symbols and characters expressing a string or pattern to be searched for within a larger piece of text. Regular Expressions are all about text. It is a tool that allows us to work with texts by describing text pattern for validating email, news, stories, text messages, computer code, contacts and all sort of data available. When we see it pluralized, we are talking about the formal language of these symbols that needs to be interpreted by a regular expression processor. A processor allows us to match, search and manipulate test by using those symbol. We will talk about regular expression processors later in a bit detail. Regular Expressions are not a programming language, they may seem similar with a defined set of rule. Most programming languages use regular expressions. There are no constants or variables or loops and you can’t add one plus one. They are just the symbols to describe a search pattern. Frequently you will find hear them as regex or regexp. I will be using regex in these tutorials. The plural of regex is regexes. In each of these cases, you will be using regular expressions. A regular expression matches text if it correctly describes the expression. Let’s take a quick look at the history of regular expressions before we move on. 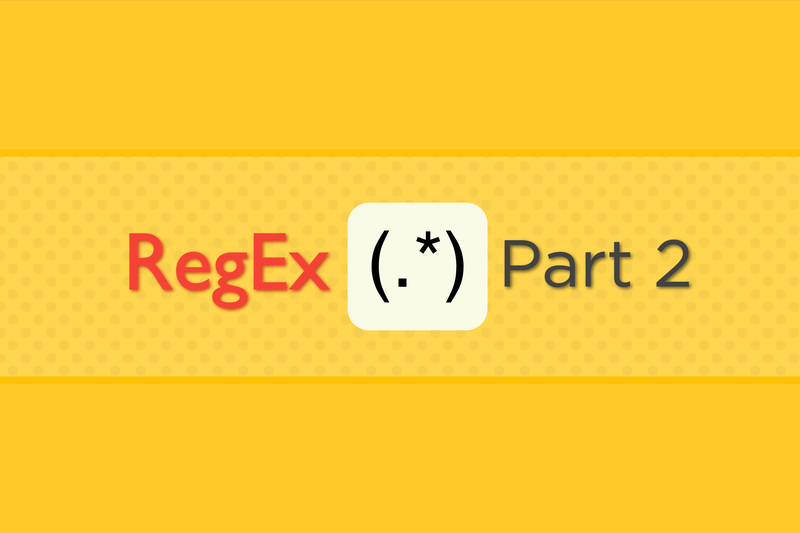 If you are not interested in the history of regex feel free to skip this lesson and continue learning. Regular Expressions first got their start in the field of neuroscience in the 1940s. In 1943, McCulloch and Pitts developed models that describe how the human nervous system works, or how a machine or a computer could be built to act more like a human brain. In 1956, mathematician Stephen Cole Kleene described regular languages using his mathematical notation called regular sets. It’s not until 1968 when Ken Thompson, one of the key developers of UNIX implemented regular expressions inside a UNIX text editor called ed. This is where regular expressions enter the computer world, and it happens right there at the birth of UNIX. In ed text editor, you search for regular expressions by typing g, a forward slash, then writing the regular expression you want to search for. Then you end it with a forward slash and a p. This is how it looks like g/Regular Expression/p. g and p are the modifiers. g is telling the processor to search globally meaning everywhere and p is telling the processor to output the results on the screen. We call it grep an acronym for Global Regular Expression Print. It gets popular and became widely used in other Unix programs such as awk, ecmas, vi, et al. Changes were made in the grep and egrep(extended grep) was released. In 1986, POSIX (Portable Operating System Interface) was released as standard to ensure the compatibility across different operating systems. Essentially there were two types of regular expressions. BREs were maintained for backward compatibility and EREs are used by modern tools use. So this effort standardizes the regular expressions. In 1986 Henry Spencer releases a regular expression library in C. This library could be added in other programs. It provides consistency because everyone who uses its library, their expressions work the same way. In 1987 Larry Wall releases Perl programming language. It uses Spencer’s regex library. Many powerful features were added over time that makes it the gold standard that people wants their library to work. So Perl compatible languages and programs came out. It’s hard to talk about these engines because there could be very subtle differences. Most of the basic features of the regular expression are same across all of these engines. Most of the engines are using EREs and Perl-Compatible engines. I’ll highlight the differences and the important exceptions among these engines. You need to consult the documentation for that language or that engine to get the real facts about how things work. Here we will be talking about general principles of regular expressions regardless of which one of these languages that you work with. In these tutorials, we will be using PHP (PCRE) engine. You could use a very useful online resource Regex101 for testing the regular expressions. Regular Expressions always starts and ends with a forward slash. It is a convention that came from the grep. When I talked about the history of regular expressions I talked about grep. Regular Expressions in grep were written like g/re/p. So this convention came from the UNIX. When using Regex101, do not add slashes because they will be added automatically. Therefore, do not add forward slashes when writing regular expressions while testing in Regex101 but write forward slashes when using regex inside a programming language. Regular Expressions comes in several different modes. Global /re/g which is used by writing g after the slash. It shows global mode. Case-Insensitive /re/i which makes regex search case insensitive. By default regular expressions search is case sensitive. Multi-line /re/m that matches result in multi-line. We will be talking about all of these in depth later. Mode comes after the regular expression. It’s not the part of regex, its a modifier that changes the way regex would be handled. You could select the flags icon in regex101 to change add or remove modifiers. Modifiers are also called flags. You can buy Master Regular Expressions from Scratch course for just $10. You will learn Regular Expressions practically.